Making tracks to Sunshine Coast? Keen to book a bed in Sunshine Beach? We have 97 options within a radius of 5-kilometre. It doesn't get much more central than the Fairshore Noosa and the Netanya Noosa! If they don't meet your needs, the Sofitel Noosa Pacific Resort and the Bella Casa Noosa are also nearby. Hastings Street features 15 hotels to book, making it one of the best neighbourhoods in Sunshine Beach to find a room. You'll find Hastings Street 2 kilometres from Sunshine Beach's centre. The Maison Noosa Beachfront Resort and The Sebel Noosa are all recommended options. Take your friends and family for a game of soccer or a relaxing afternoon walk through Ed Webb Park. If you want to see this attraction and would like to spend a night or two nearby, take a look at The Rise Noosa and Peppers Noosa Resort and Villas. The buzz of insects will be music to the ears of hikers who wander through Noosa National Park. You can stop by this attraction everyday, especially if you're based at Saks on Hastings and Noosa Springs Golf Resort & Spa. For those wanting to save money, Sunshine Beach has a limited number of choices. 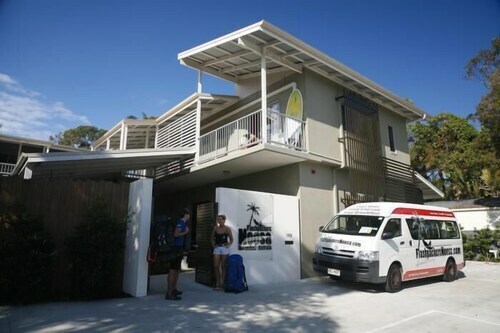 The best pick of the bunch is the Noosa Flashpackers - Hostel. For more options, look at the Eumarella Shores Noosa Lake Retreat and the Retreat Beach Houses. They are located 6 kilometres and 7 kilometres respectively from the main center. Others include the Aqua Vista Resort, 30 kilometres away, and the Sebel Twin Waters, 25 kilometres. The close by localities of Doonan and Peregian Springs are certainly worth seeing. Doonan is 11 kilometres to the southwest of Sunshine Beach, while Peregian Springs is 11 kilometres to the south. Hotels in Doonan are the Noosa Country House and Coverdales B & B at Eumundi. The Coolum Caprice and Coolum Seaside are some of the ones in Peregian Springs. If you're travelling into or out of Sunshine Coast Airport and are looking to stay nearby, check out the latest deals at the Sand Dunes Resort or the Magnolia Lane Apartments. How Much is a Hotel Room in Sunshine Beach? 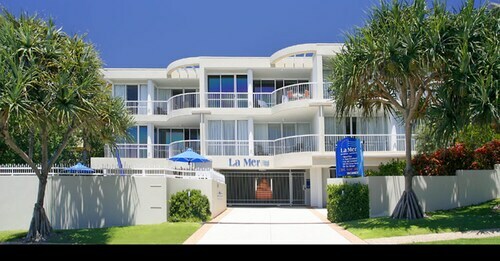 Hotels in Sunshine Beach start at AU$82 per night. Prices and availability subject to change. Additional terms may apply. Location, peacefulness, view and amenities in the unit. Couldn’t have asked for more. The en-suite room was perfect for my needs. Although a modesty screen for the bathroom window would be nice.